Neil deGrasse Tyson (b. 1958) is an astrophysicist, science communicator, the Frederick P. Rose Director of the Hayden Planetarium at the Rose Center for Earth and Space, and a Research Associate in the Department of Astrophysics at the American Museum of Natural History. Since 2006 he has hosted the educational science television show NOVA scienceNOW on PBS. Tyson graduated from the Bronx High School of Science, and went on to earn his BA in Physics from Harvard and his PhD in Astrophysics from Columbia. Tyson's has conducted research with the Hubble Space Telescope, Palomar Observatory, Cerro Tololo Inter-American Observatory, Millimeter Radio Astronomy Institute, Apache Point Observatory, Very Large Array, and Kitt Peak National Observatory on star formation, exploding stars, dwarf galaxies, and the structure of our Milky Way. Tyson was appointed by President Bush to serve on commissions to study the Future of the US Aerospace Industry and the Implementation of the United States Space Exploration Policy. In 2006, the head of NASA appointed Tyson to serve on its Advisory Council. Monthly essayist for Natural History magazine under the title "Universe." Fourteen Billion Years of Cosmic Evolution, co-written with Donald Goldsmith. (Origins is the companion book to the PBS-NOVA 4-part mini-series Origins, in which Tyson serves as on-camera host). Beginning in the fall of 2006, Tyson has hosted NOVA ScienceNOW on PBS. In the accessible style of which Neil deGrasse Tyson is famous for, he provides insight into the complexities of the science that shapes the understanding of our place in the universe. During the summer of 2009 Tyson joined with co-host Lynn Koplitz, a professional standup comedienne, to bring science to commercial radio with the NSF-funded pilot program StarTalk. Combining celebrity guests with informative yet playful banter, StarTalk's target audience is all those people who never thought they would, or could, like science. 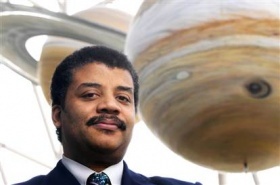 Tyson is the recipient of twelve honorary doctorates and the NASA Distinguished Public Service Medal, the highest award given by NASA to a non-government citizen. Minor planet 13123 Tyson was named in honor of Neil deGrasse Tyson for "His contributions to the public appreciation of the cosmos". In addition, Tyson was voted "Sexiest Astrophysicist Alive" by People Magazine in 2000. Tyson lives in New York City with his wife and two children.